The septal extension graft (SEG) is a workhorse for tip rhinoplasty especially for the Asian nose. It can control the tip projection, rotation and nasal length at the same time. nasal tip deviation is unforgiven complication after SEG. The first study reviewing the cases between 2008 and 2010 showed nostril asymmetry developed in 23% of the cases. The cases using ear cartilage for extension showed higher incidence. The cases with bilateral grafts showed lower risk than those with unilateral graft. The use of ear cartilage graft was found to be related with high risk of asymmetry. In the second study reviewing the cases between 2011 and 2013, nostril asymmetry was found in 22% over all. 91% of the cases who had asymmetry preoperatively developed deviation postoperatively. The cases with no preoperative asymmetry developed deviation in 13%. The asymmetry was noted at two weeks following the surgery. The cases with past history of rhinoplasty showed higher incidence of asymmetry. In 19 cases, the harvested septal cartilage was so small that the septal cartilage was placed end-to-end fashion in the midline and preserved cartilages were placed bilaterally for support. This group developed asymmetry in 6% if there was no asymmetry preoperatively. 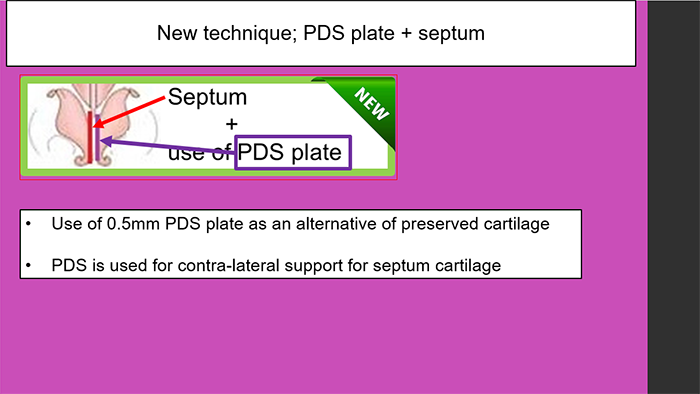 In 2014, we used PDS plate combined with autologous septal cartilage for SEG. Those cases showed early loss of tip projection, deviation and fistula formation. These results suggest that the use of three pieces with one piece placed end-to-end with bilateral support is most useful to reduce a risk of postoperative deviation. The use of PDS plate is not recommended. 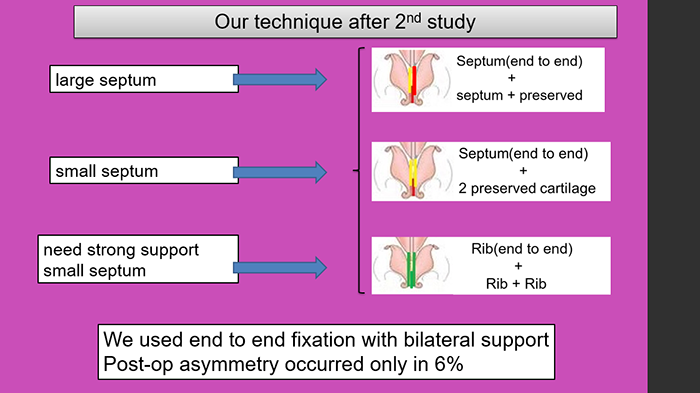 Since the second study we have chosen the technique of end-to- end fixation of either septal or costal cartilage with bilateral cartilage support. The review of 23 cases showed nostril asymmetry in 6 %. A potential problem of end-to-end graft and our strategy using template during the operation will be demonstrated in the presentation. 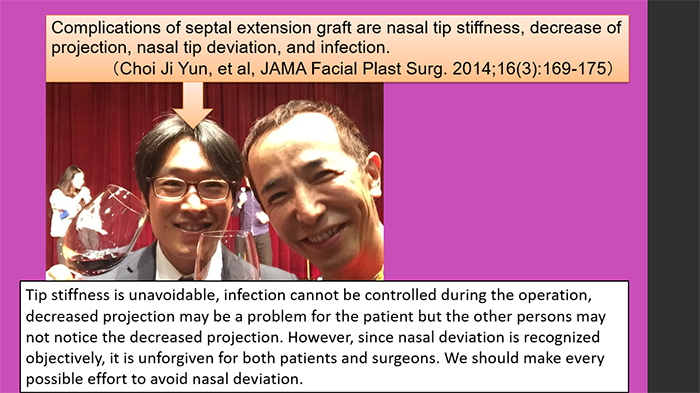 Dr. Choi Ji Yun published in 2014 that the complications of septal extension graft are nasal tip stiffness, decrease of projection, nasal tip deviation, and infection. Tip stiffness is unavoidable, infection cannot be controlled during the operation, decreased projection may be a problem for the patient but the other persons may not notice the decreased projection. However, since nasal deviation is recognized objectively, it is unforgiven for both patients and surgeons. We should make every possible effort to avoid nasal deviation. The purpose of study is to investigate the incidence of nasal deviation in our septal extension graft patients and to search for the technique to reduce the risk of nasal deviation. In the first study, we reviewed the cases who received the septal extension graft from 2008 to 2010. The follow up period was more than 3 months. 125 cases were involved in this study. This is the incidence of deviation in different types. As you can see, the use of ear cartilage shows bad result. In addition to these three, we employed 2 new techniques. 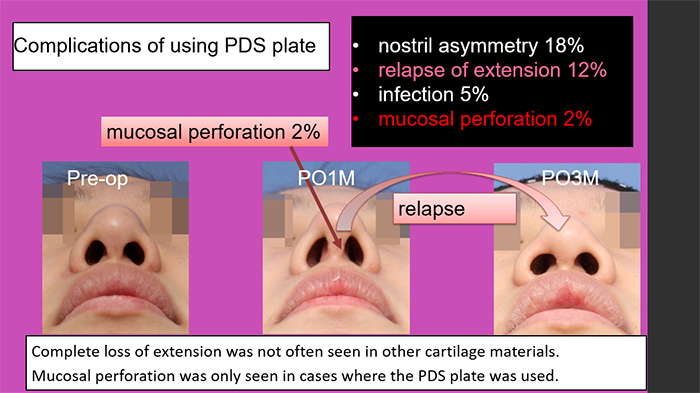 Since we heard PDS plate is a good alternative for preserved cartilage, we decided to start using PDS combined with septum cartilage at that moment. There are three thickness available in the market. 0.15mm, 0.25mm, and 0.5mm. We chose 0.5mm which was the hardest product because?we found 0.15mm and 0.25mm were not strong enough for support. 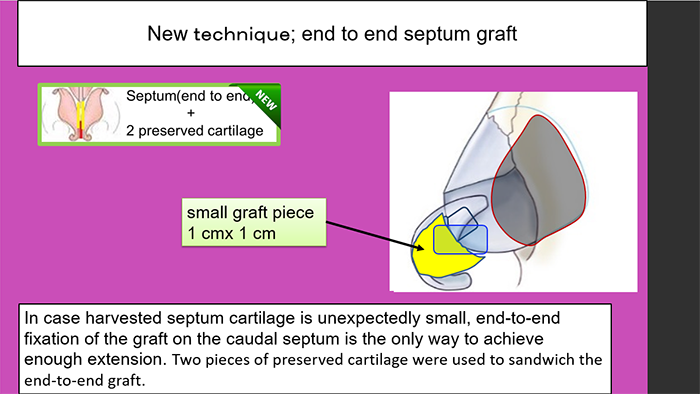 In some cases, we found the harvested septum cartilage was very small such as 1cm by 1.5 cm. Since no alternative choice was available, this new technique was adapted. In this situation, the overlapping fixation with the caudal septum could not provide sufficient extension. End-to end fixation is the only choice to make a enough extension. 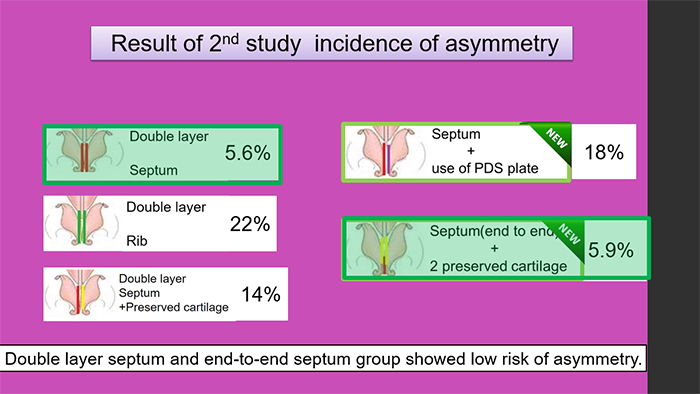 In the second study, Double layer septum and end-to-end septum group showed low risk of asymmetry. PDS plate group developed asymmetry in 18% which was better than we expected. However, there were other problems with PDS plate. Several months later, relapse of extension occurred. 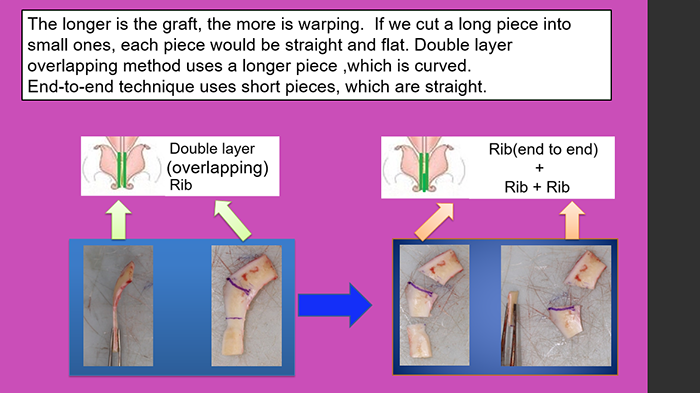 The longer is the graft, the more is warping. If we cut a long piece into small ones, each piece would be straight and flat. Double layer overlapping method uses a longer piece ,which is curved. End-to-end technique uses short pieces, which is straight. If the harvested septal cartilage is large enough, we make 2 pieces of septal cartilage and use one for end-to end and the other for lateral support. In case the septum is small, end-to end septum with two preserved cartilage. Another technique is using rib for both end-to-end and lateral supports.